From Square Enix. From Kingdom Hearts III, Sora in his pirate outfit as he embarks on an adventure in the world of Pirates of the Caribbean is now available as a BRING ARTS figure! 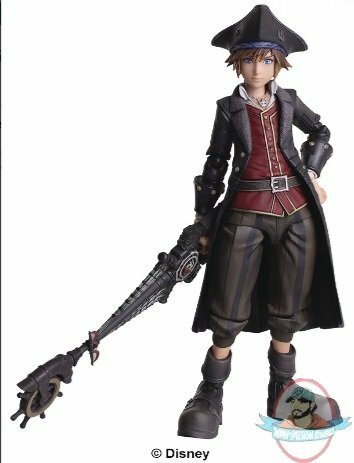 The mood of the world is recreated through the highly detailed sculpt work of Sora's long coat while paying careful attention to the material, and the coloring used throughout, giving it a weathered look. The coat and shirt are also made using a soft material to smooth articulation and posing. The figure comes with the Wheel of Fate Keyblade made in the image of a compass and the tip of a sail, two heads with different expressions, and six hands. The figure allows you to enjoy recreating various scenes and the atmosphere in the game.